Stop. Who would cross the Bridge of Death must answer me these questions three, ere the other side he see. Okay, so really it’s more like “these questions eleven” than “these questions three.” And instead of a mystical bridgekeeper with wild hair and skin in desperate need of a soothing ointment, we have the delightful and always-pleasant Tami Clayton, who was kind enough to think of me when it was her turn to tag people for some sort of question-themed blog game. But I couldn’t pass up a chance to deploy a Monty Python and the Holy Grail reference, now could I? Pass the questions on to eleven people by tagging and linking to them. Ask me the questions, bridgekeeper. I am not afraid. I would totally live in the fictional world where my work-in-progress is set. Then I’d know more about what it’s like and what happens there, making it easier to finish my novel. I’d be able to come back, right? Maybe via an octopus-drawn chariot that travels between the worlds? I read mostly fiction, but lately I’ve been mixing in more non-fiction because learning more about Chinese history, mythology, and philosophy benefits my WIP. Quiet places. It’s hard to read where it’s noisy, such as inside an erupting Icelandic Volcano. Apparently I should know because, according to Klout, I am somehow influential in the subject of Icelandic Volcano–perhaps because I might’ve once flown over one in a plane. Not really, although when considering a new purchase, I like to skim reviews to see if a book is generally considered good. Mostly the mood I’m in at the time influences what I read. If these are my only two choices, I’d have to choose paperbacks, but my preference is for ebooks. Even better would be sitting in an oaken hall, warmed by flickering firelight while the northern winds howl outside, listening to the elder tell tales that were ancient even when he first heard them as a boy. But ebooks are good too. 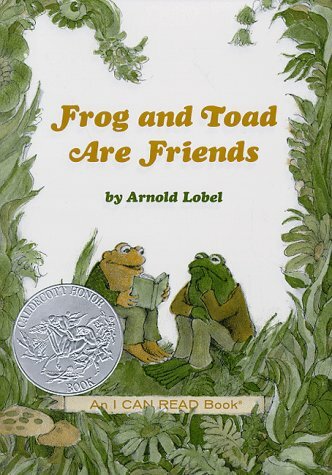 I suppose that would be Frog and Toad Are Friends, a collection of harrowing tales full of adventure and intrigue. I actually don’t have a favorite–just different authors I enjoy reading at different times, for different reasons. In recent months, I’ve enjoyed Jim Butcher and Lian Hearn. Modern novels, although I’ve been reading the Chinese classic, Journey to the West, because it feeds my WIP. Solitary reading. I’ve never been in book group, so I have no sense of what such an experience would be like. Is it like a gladiatorial combat? Tough one. I suppose The Lord of the Rings. In addition to being timeless, it’s dense reading material, so it should provide sufficient entertainment during a lengthy zombie apocalypse. Bridgekeeper: Huh? I… I don’t know that. Ahhhhhhhh! Thanks for the tag, Tami! Would you like to answer the bridgekeeper’s challenge and answer some of “these questions three?” Do you have a favorite Monty Python quote you’d like to share? This entry was posted in Miscellanea and tagged author, books, fiction, mike schulenberg, writer on April 18, 2012 by Mike Schulenberg. Yeah, I saw that Frog and Toad Are Friends is still in print. I remember feeling bad for Toad when he wouldn’t come out of the pond because of his bathing suit, and his friends promised they wouldn’t laugh, but then they laughed anyway. I wonder what a Frog and Toad Are Friends movie would be like if it starred Johnny Depp, with Tim Burton directing? At any rate, Mike, thanks for the gift of these eleven questions. Turns out they came on a lucky day: “Almost Q Day in the A to Z Blog Challenge.” Therefore, I have been working on answers to questions that justjacqui2 sent my way. I’ll add yours to hers and be done with it. I’m not promising “real” answers…whatever that means! Gosh, I haven’t watched Monty Python in a while, and reading this post I just realized how much I miss it! Great answers to these many questions. Thanks for the tag, Mike! Is it okay if I cheat? Yes? GREAT! I also got tagged on eleven questions today by Nigel Blackwell, so here’s what I plan to do. Randomly pick from the two lists of questions to decide which I will answer. Oh. Okay. I am totally planning to toss the questions that give me heartburn and use an alternative. If you’re not cool with that, ask Qegu. If Qegu isn’t cool with that, don’t check my site for a week. Um. No. No reason. I love your answers and the Monty Python quotes. Priceless! p.s. With your voice and humor hits, I want you to stop blogging immediately and finish your dang book! Awesome answers, I’m linking to this post in my blog today no matter how unrelated lol. Thanks, Catherine…I’m happy you enjoyed my post that much. 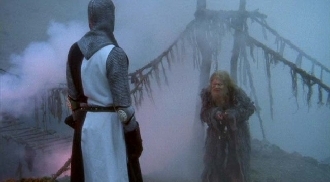 Ah, the bridge of death – soooo enticing! Thanks for the tag, Mike. I’m drip-feedinug my answers over the next several weeks. I just posted my response to question 2. The monty python highlights are a great idea for dressing up one of the meme posts – good thinking! It’s great to read your answers. You’re welcome, and thanks for the compliment. I’m glad the Monty Python schtick seems to have gone over so well. Would that be the skit with the “pining for the fjords?” I’ve been pining for the fjords, myself. Mike, not much to add with all the great comments above. I want you to know I love your humor and colorful writing. Speaking of “colorful,” I first misread Laird Sapir’s comment above and thought she was asking if you (not octopus-drawn chariots) came in various colors! Actually, I think you come in Technicolor. Since Technicolor is a method of making movies in color in which films sensitive to different primary colors are exposed simultaneously and are later superimposed to produce the full-color print (person), what’s the debate? You’re a Technicoloroid! Hi, Jodi…thanks very much for dropping by, and for the wonderful comment. Yeah, I didn’t really like The Harsh Cry of the Heron, either, although I don’t remember exactly why. But fortunately I read Heaven’s Net Is Wide last, which I enjoyed even more than the original trilogy, so I at least got to leave the books on a high note. Yeah, it was really neat to find out about all the stuff that happened before the original trilogy takes place. If you read someday, let me know how you like it. Will do! Though I first need to dig out my books from a medieval literature college class. Reasearch material for my newest novel idea! Do you have a blurb for your eastern-inspired fantasy yet? I love that setting, so you have piqued my interest. No blurb yet, just a Sentence For Revision I came up with for one of the HTRYN lessons. If I recall, you’re one of Holly’s students, right? And I will definitely think of you when I need beta readers. Sadly that won’t be as soon as I would like. It’s my first novel, so the learning curve is quite steep, as I’m sure you know. But I’m starting to see the shape of what it might become, so it’s a pretty exciting time. I left a comment yesterday, but I think WordPress ate it. Apologies if this is a duplicate. I was glad to read your post so aI now know my contact for Icelandic Volcano information. I also LOVED Frog and Toad. Frog and Toad rocked. I should read it again and see how it withstands the Test of Time™. After reading this, I want to read Lord of the Rings, alone, in a quiet room and then watch every Monty Python movie I can with a few Fawlty Towers episodes thrown in for good measure. I hadn’t heard of Fawlty Towers before. It sounds pretty entertaining. I’ll have to check it out sometime. “It IS the rabbit! !” I love this movie. I read in quiet places mostly. I’ll read in the airport if I’m forced to wait. Fictional place – my favorite fictional place would be where I just won a huge lottery AND I got to meet my favorite author. One book to read for the rest of my life? It would be my book, when I get it done.